The Mystery Machine is brought back to life in this amazing bouncer w/ slide. This 3-in-1 combo offers an exciting dual-lane climb and slide and an awesome jump area; kids will spend hours trying to help the gang solve the mystery. 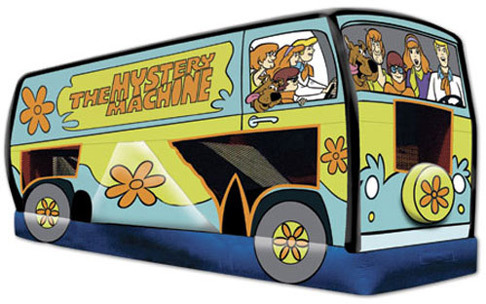 This unique 3-in-1 combo is designed to look like the original Mystery Van, with the entire Mystery Team seated inside, including Scooby, Fred, Daphne, Velma, and Shaggy. Scooby fans of all age will adore this classic cartoon slide, perfect for any celebration or event. The slide offers 360-degree mesh windows, so spectators and care takers can have a clear view of all the fun.